Princess Skyler Hat by Louisa Voisine Millinery. Fast worldwide delivery. Click or call 323-592-9172 for more info. Louisa Voisine: "Princess Skyler is inspired by my favorite time of year. The freshness of spring, watching the fresh buds appear and slowly open to soft warm light of the sun. This design became a vision while sitting in my backyard garden of beauty." 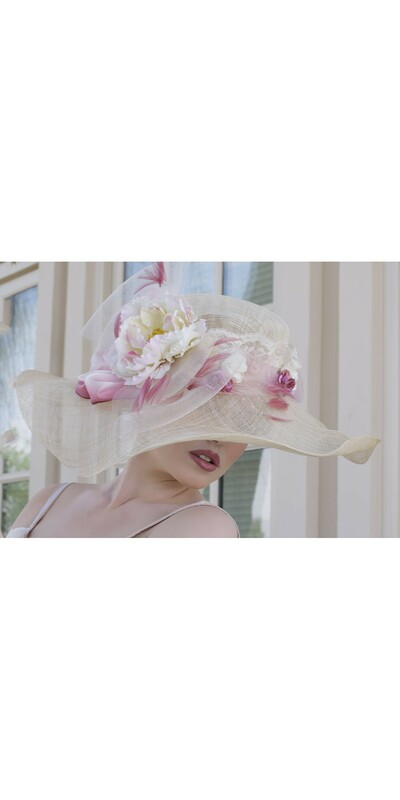 The Princess Skyler hat by Louisa Voisine Millinery is the embodiment of feminine beauty and charm. This hat is the perfect accessory for summer with its airy construction and wide brim. A wide lace ribbon encircles this hat while gauzy ribbons give a feeling of lightness. This piece features a large peony accented by feathers and small flowers in varying shades of pink.